Anybody been on a cruise? People seem to love them or never want to set foot on a cruise ship. I’m somewhere in between. I had no interest – other than an Alaskan cruise which is still on my bucket list – until our friends Coco and Lou suggested we join them on their Mediterranean cruise. What fun we had with a group of 16 friends from Colorado and Pennsylvania cavorting among the 1,500 on the Brilliance of the Seas (Royal Caribbean). While the cruise didn’t change my mind about future cruises, I was pleasantly surprised at the lack of long lines, interminable waits and crowded conditions we had been warned to expect. Those simply didn’t occur on our ship. We started in Barcelona and round-tripped it through ports in France, Italy, Greece and Turkey before flying home from Barcelona. One of the small asides I enjoyed on the water was watching the tugboats at each port of call. Those tiny little boats belied their strength and agility; and the men who worked the tugs had to be the hardiest stock to brave those waters and perform that unsteady, heavy manual labor day after day, cruise ship after cruise ship. Watching them position themselves – sometimes scurrying to realign – reminded me of a border collie herding sheep: all watchful eyes and quick, deliberate directional changes to keep his flock in position. 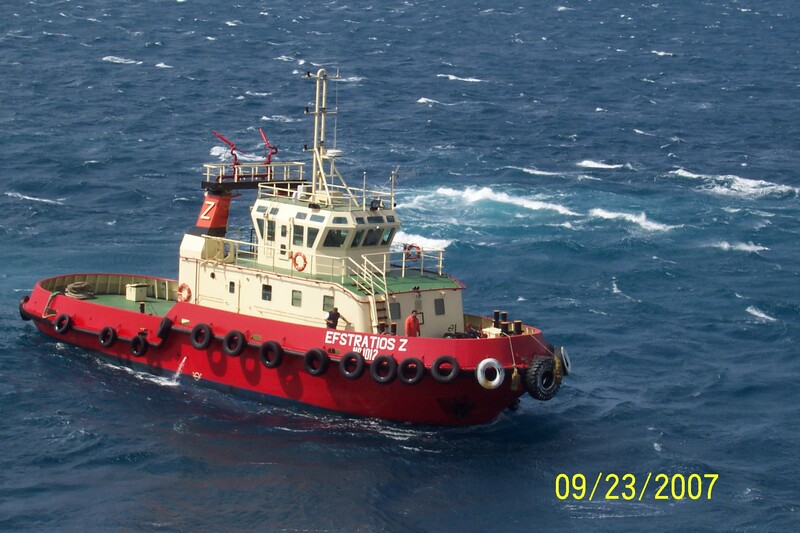 Each tug was brightly painted; I suppose more to protect against the sea salt than for my viewing pleasure. Nevertheless, I enjoyed the brilliant blues and reds, and also took special notice of each boat’s name, proudly displayed on the side of the tug. Some appeared to be family names. Not everything goes according to plan. The day we were scheduled to arrive on the island of Mykonos – despite bright blue sky and sunshine – the wind was fiercely gusting, and the sea was very rough. Our captain had warned us ahead of time that docking was “iffy”; the pictures don’t do justice to the size of the waves those tugs faced in their quest to deliver us to the island. After several attempts, the captain came on the loudspeaker and announced that one of the lines between the ship and a tug had broken, a sure sign we weren’t safe to continue. Regretfully we turned away from Mykonos, and the tugs chugged their way doggedly back to port. I started musing about the complex, behind-the-scenes planning and co-ordination just to bring one cruise ship to port. 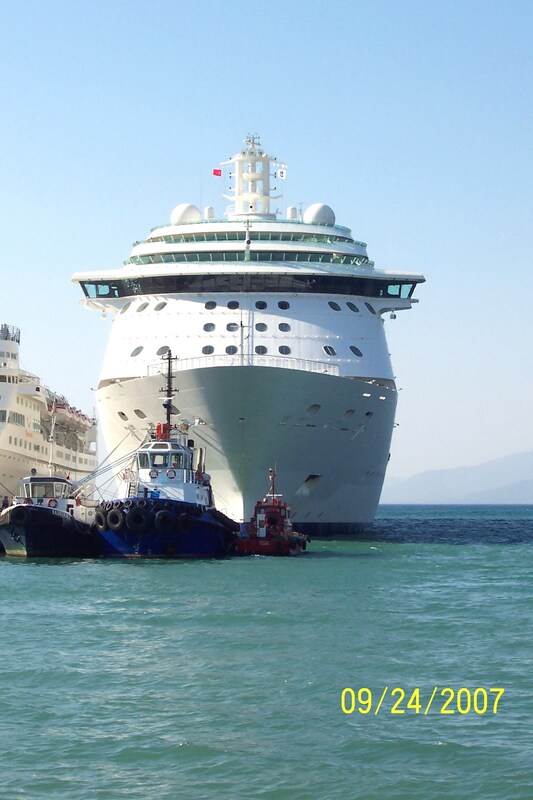 How many people, supplies, pieces of equipment, and boats are utilized every time a large ship comes to port? Who co-ordinates the comings and goings; who assigns the tugs; who monitors the weather; who allocates the supplies? Where do they gas up? Do they perform their own repairs? How many families are employed in that industry? How many young men follow their fathers footsteps or inherit their livlihoods? The list goes on. 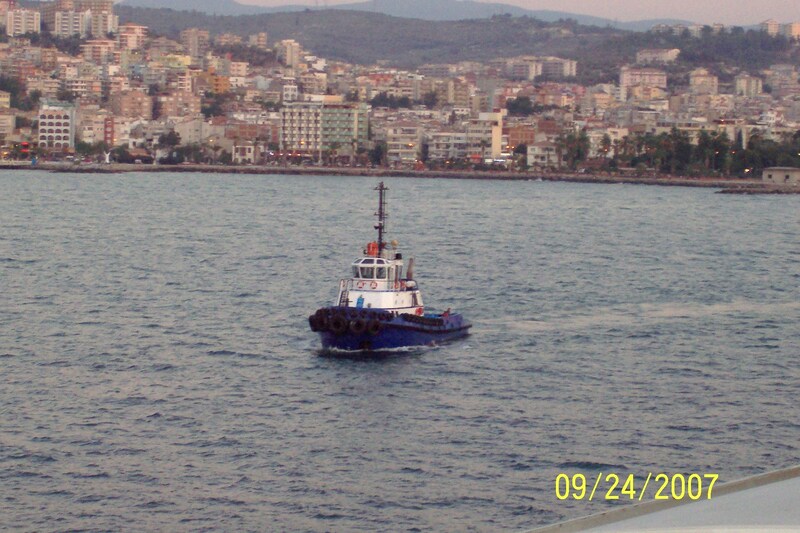 When we approached the port of KusaDasi, Turkey in late afternoon, I stood on our narrow balcony watching the tugs come to greet us. The two on my side of the boat were a large bright blue one and a tiny flashy red one. He looked like the litter of the runt, just spunky enough to keep up with his big brother. But they were all business, and it was no time at all before we were securely docked and off the boat to hear the wail from the muezzins at nearby mosques calling their followers to prayer. Watch for that little red runt pulling his weight on the right hand side! I’ve never been on a cruise and the med sounds a wonderful place to try it out. 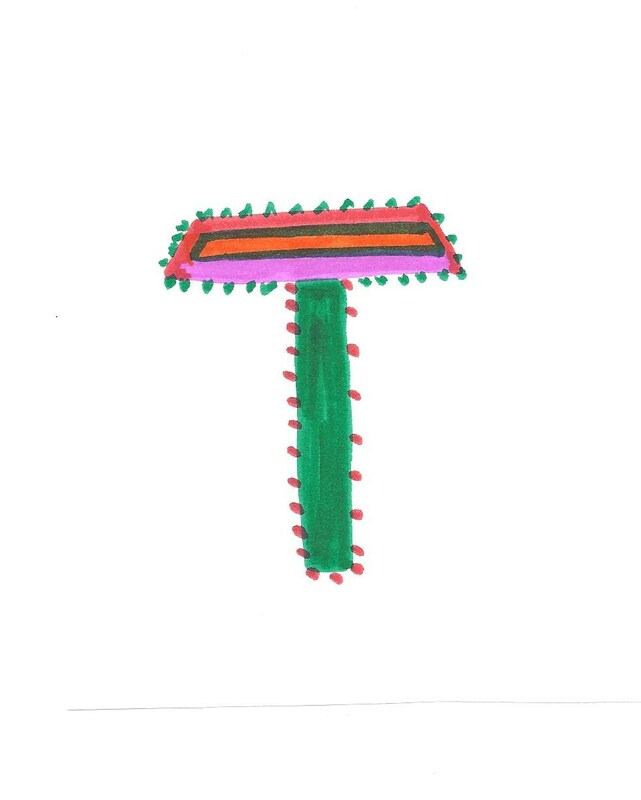 Lovely post about those often not noticed yet who do an essential role. That would be a very unusual venture! Like you, I’m skeptical about crowds and lines on a cruise ship, and haven’t ventured to try it yet. The Mediterranean looks like a great place to start! They are everywhere – the necessary and underappreciated! The Med was great – our day in Turkey was one of two favorites. Looks like your trip was gorgeous. Love the photos. Thanks, Carrie! Cruises seem to be perfect for many families, just as you said. I feel guilty once in awhile, too, but honestly the tourist trade is what gives them a chance to support themselves. We try to tip generously and show our verbal appreciation aling the way. Terrifying. I want to be IN the water, never ON it in a boat. Must’ve gone down with the Titanic! Love the last pic! Ooh I feel your fear! There have been so many water-related mishaps in the press lately. Nightmare inducing! I wished I could get an overhead view to see the tugs in action from all sides. Especially that windy day offshore from Mykonos. Chocolate in Alaska – what’s not to like! We agree with you – there was much I liked about cruising the Med (no packing/unpacking) but the days ashore feel limited and sometimes rushed, and evenings in new places are something I missed on that trip. We generally went on our own for the days ashore and used local transport rather than organized tours, so got as much of independent experience as we could. Great pictures and great story. I have always loved tug boats and used to watch them in the Long Beach harbor guide in the giant tankers. As a child, they were so much cuter than the bigger ugly ships. Come to think of it, they are still cuter than the big ugly ships. The little red one in your picture is my favorite. I think it would be fascinating to spend an extended period watching what goes on in a harbor like Long Beach. Our water transport system affects every life in one way or another when we consider rivers, lakes and oceans. 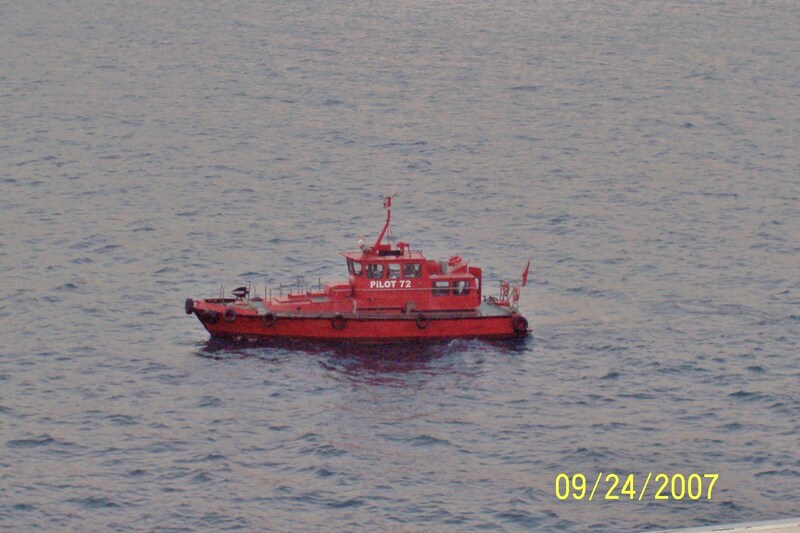 Yes, that little red tug was a scrapper! Thanks for your comments – thought provoking! 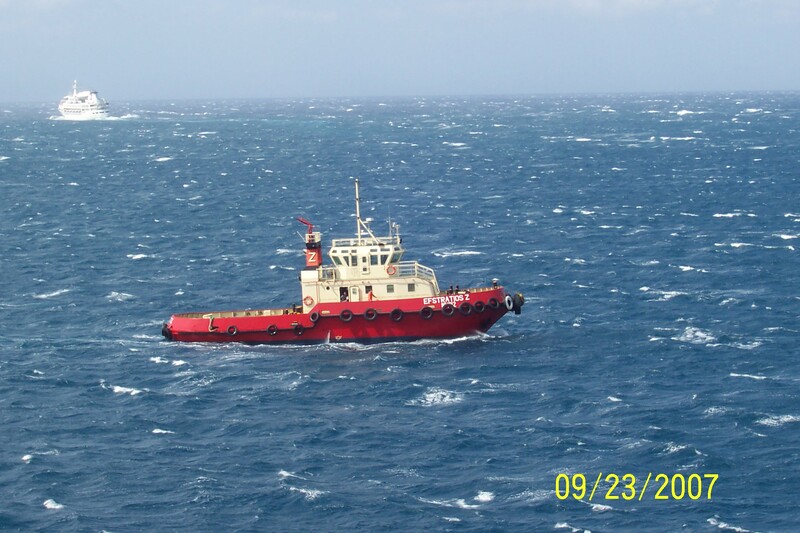 I’ve been on a Carnival cruise ship, but never a tugboat. Excellent photos, Sammy! Thanks Deb! That would be quite interesting to tour a tugboat! A career on the water, of any sort, never appealed to me, but what a breadth of industry that encompasses. I hear the Panama cruise is worthwhile – especially with renovated canals. Great image about mules in the past – wonder if mule bosses retrained to pilot boats or lost their jobs! Sounds like a fabulous trip Sammy! 🙂 Shame about Mykonos though. We landed there on our Greek islands cruise, but didn’t stay all that long. The tug boats were out in force and yes, it is amazing how well-coordinated they are. Nice photos you have here. Although our ship was pretty crowded, especially for meals, I’d love to go on another cruise some time. We heard it wasn’t unusual for mykonos port to be a windy docking – i was disappointed. Santorini made up for it! I’m thinking of going on a cruise. I lost my partner last year and I feel it is something I could happily do on my own. For me, the organised trips ashore would be a bonus (although if he was alive, we would have explored on our own the same as you). At the moment I can’t decide between Iceland and Norway with a chance to go whale watching, or a river cruise along the Danube. Those all sound fascinating. We are talking about another bike tour – perhaps this time a bike & barge in the Netherlands, but I would love to see the Scandinavian countries. I have heard iceland, in particular is expensive, so perhaps a cruise gives you a better $ economy than land-based there. I am sorry you lost your partner and traveling companion. I agree with you – a cruise could be a safe and enjoyable way for you to travel solo and give you options for engaging with others on the boat or not. Most nights Hub and I chose to eat by ourselves in the lowkey buffet restaurant rather than the dressier dining halls with elaborate menus and seating for 8. We yakked with others during the day, but wanted some “downtime” in the evenings. And keep me posted on your plans! We wouldn’t go until 2015 if we do it. Mentioning the things that normally escape our minds was really amazing and appreciable. a fascinating account indeed…..I enjoyed reading your post a lot…. Thank you so much for visiting. I appreciate your comment! I’m one of those people who wouldn’t go boating no matter where, how or in what kind of boat. Mostly because of my muscle condition, the balance and stability isn’t what it should be, but also because I’m no sea-and-boat-person. Never have been. That doesn’t mean I never have sat foot on boats. I have! But just for short trips. On the other hand, I have all my life been longing to travel. Around the world, to exotic places, meeting new people, experience other cultures et cetera. But I never have. Ninna – i am sorry you haven’t been able to realize some of your dreams, especially because of your health issues. Travel is definitely hard work, and in the re-telling, we tend to make it all sound easy and even glamorous. I hope eventually you will find a way to journey to one of your more economical and accessible destinations to satisfy your yearning. Oh, it’s not so bad. I can dream, can’t I? In the dreams I can go anywhere! So much easier to travel in living dreams with the sights and sounds we can access on the Web through travelogues, blogs and You Tube! Of all those things you listed, the ones most important to me are health and energy. Yes I agree! Health and energy! No matter what anyone do or don’t – health and energy is important. Be Brave!! Alaska does sound appealing for so many reasons – partly because land travel there doesn’t work very well. I didn’t think about seeing the NLights, that’s an added incentive. I definitely want to do a night or two in Denali, too. The weather window is short. What gorgeous pictures you’d get there! !